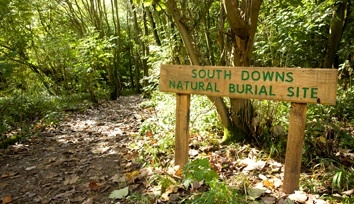 Our natural burial ground is managed according to an ecologically sound system. 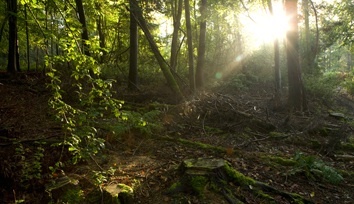 The woodland is worked as a coppice to ensure a rich bio-diversity, encouraging wildlife including owls, badgers, raptors and stoats. The native woodland, created by the planting of memorial trees, has become a lasting tribute to those who rest here. 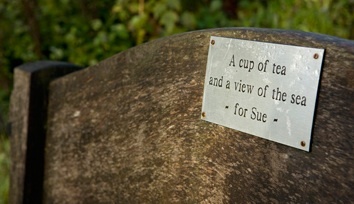 We would be delighted to show you this special and unique resting place. Please call to make an appointment. "A beautiful, peaceful place which is well managed by people who care about the ethos of the place, but also those buried there. I really can't think of how it could be improved." "Tranquil, and an environment enabling comfort and meditation." "Everyone who attended has stated a desire to be buried here... Difficult to describe the whole experience as it was perfect in every way. Many thanks." We do not accept cremated remains to be scattered or buried anywhere on the site. There is no vehicle access to the burial ground except on the funeral day when our staff can offer lifts there and back. Informal visits are welcome at any time. If you need to speak to a member of staff please make an appointment to avoid a wasted journey.